In honor of our French friends, today’s food review is a fabulous, intimate restaurant close to the Place de la Republique where millions of supporters and over 40 world leaders gathered on Sunday in solidarity and support of the terrorist attacks in and around Paris last week. We are all, Je Suis Charlie. 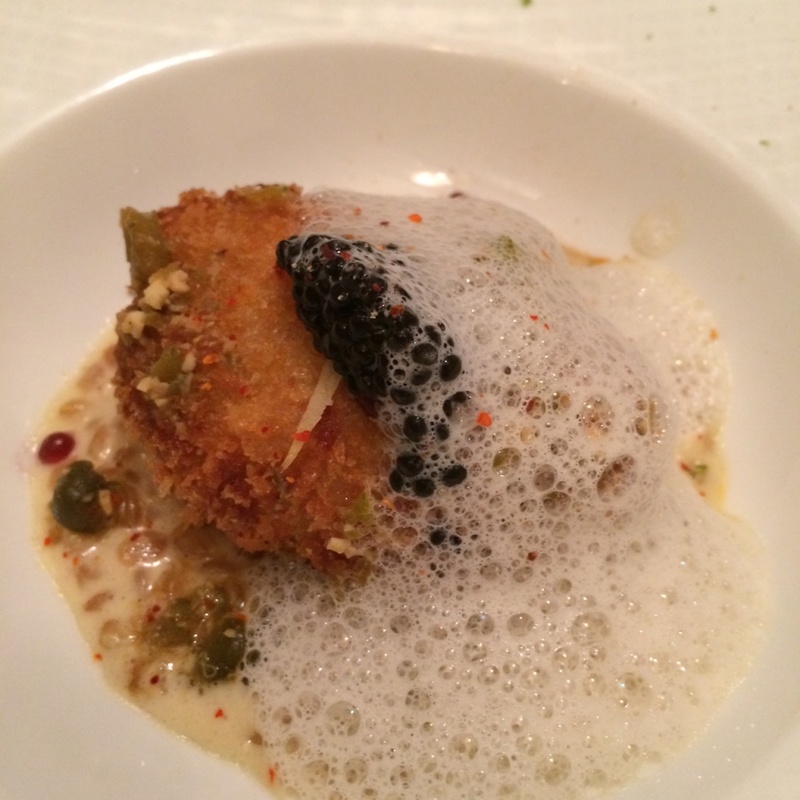 In general, dining on Sunday and Monday nights in Paris can be challenging. Why you ask…many restaurants are closed. We took to our trusty Time Out guide and employed our usually infallible foodar. Up popped Les Enfants Rouges. The reviews contained all the necessary ingredients. I called and they fortunately had a table for 3 at 8pm. After lingering over a Pastis and Eiffel Tower light show, we walked a mere 10 steps to the metro and headed back to our home turf in the Marais. We exited the efficient, clean subway and walked past familiar Marais sights. The GPS directed us to a narrow Parisian street off of the bustling Rue de Bretagne…we had passed it dozens of times and simply walked on by. We hung a right and a few doors up was the glass fronted, charming restaurant. We were warmly greeted and the delectable night began on a welcoming note. Tomoko, the chef’s beautiful, elegant wife, guided us to our table in the small and embracing surroundings. There are said to be around two dozen French restaurants in Paris with Japanese chefs at the helm. 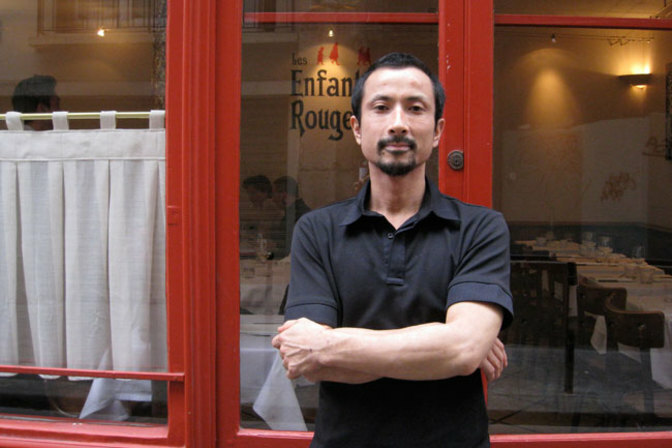 One of the most talked-about is Les Enfants Rouges, which the 35-year-old Dai Shinozuka took over in October of 2013. He retained the name of the restaurant. 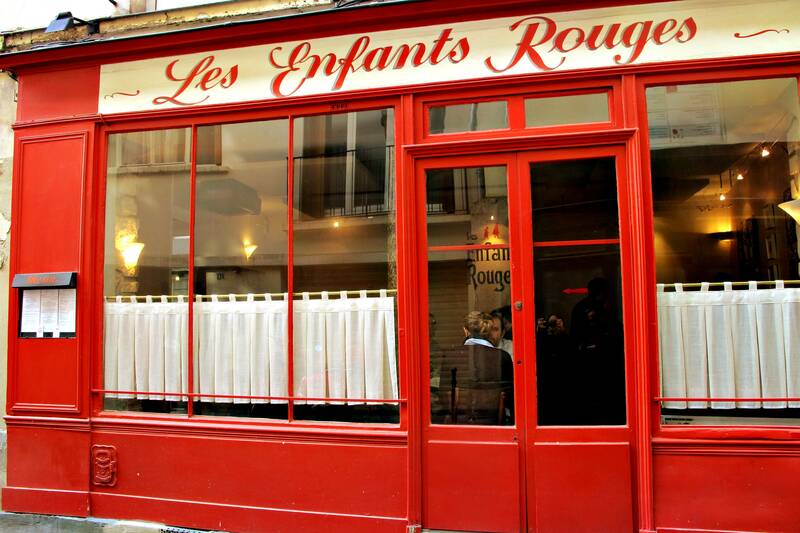 Les Enfants Rouges is situated on the site of a 16th-century orphanage where the children wore the color of charity–red, thus the name of the restaurant. 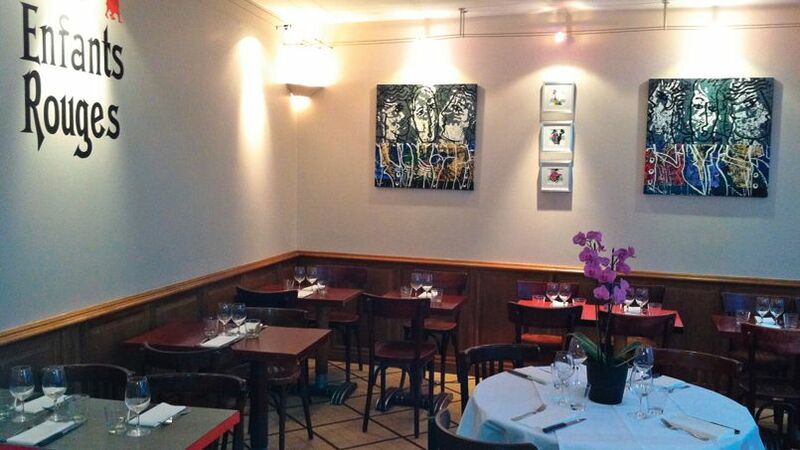 Les Enfants Rouges is close by the exceptional Marches des Enfants Rouges market that must be visited on the Rue du Bretagne. A Tokyo native, Shinozuka moved to France in his early 20s, and after half a dozen years working in the kitchen of Yves Camdeborde of Le Comptoir du Relais fame, widely regarded as the father of the bistronomie movement, he is now serving his own interpretation of exceptional french nouvelle bistro fare. With Tomoko’s honest and caring guidance as well as perfect command of English, we selected our three couse fixed price meal (39 euros/$48). We chose a lovely wine from Languedoc. Once that decision was made we enjoyed an amuse bouche of chicken consomme. I never knew consomme could be so flavorful and delicious. I had notified the restaurant in advance about David’s diet and they were completely accommodating even on short notice. 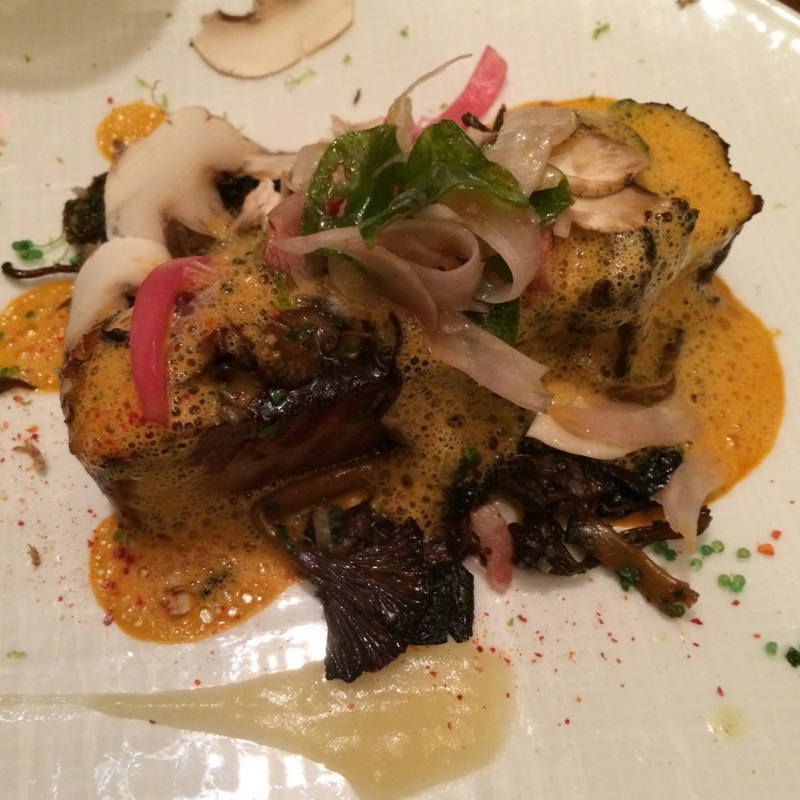 I went bold and beautiful with a sweetbread coquette that was rich and delicious. Courtny and I coordinated our meals. 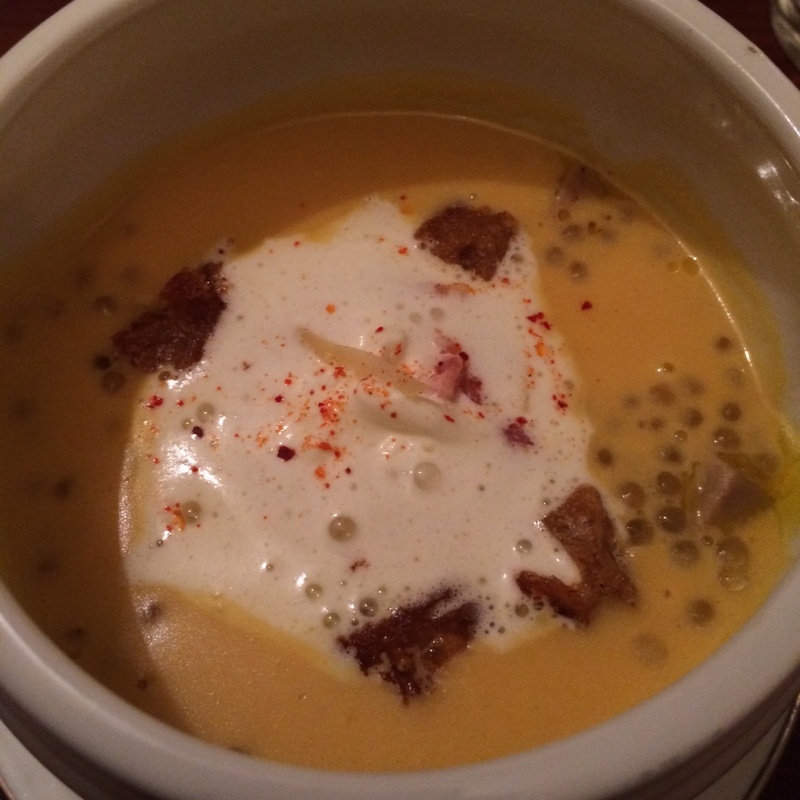 She started with pumpkin soup that was creamy and immensely flavorful…the french really know how to prepare soup. My main course was pork. One of the best most flavorable meats I have ever enjoyed. Courtny ordered the St. Jacques or scallops which were superb. David’s haddock was sauted to perfection. Desserts were obscene. 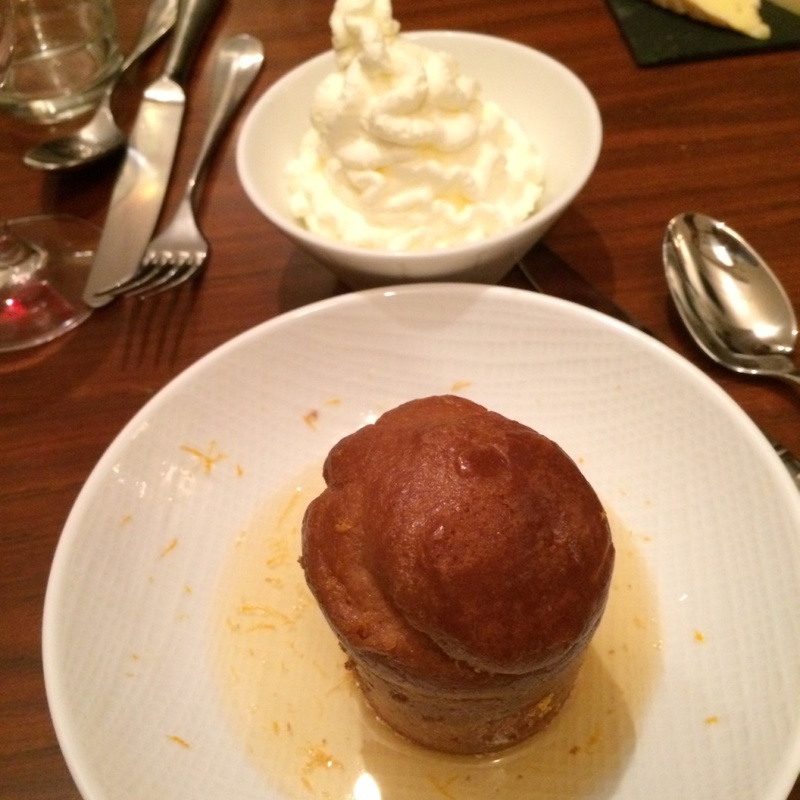 I selected Baba au rhum which was accompanied by a heaping dish of homemade fresh whipped cream and a heavy pour of rum. I never thought I would eat it…just a taste since it was the house specialty…it was stellar and impossible to have just one bite. 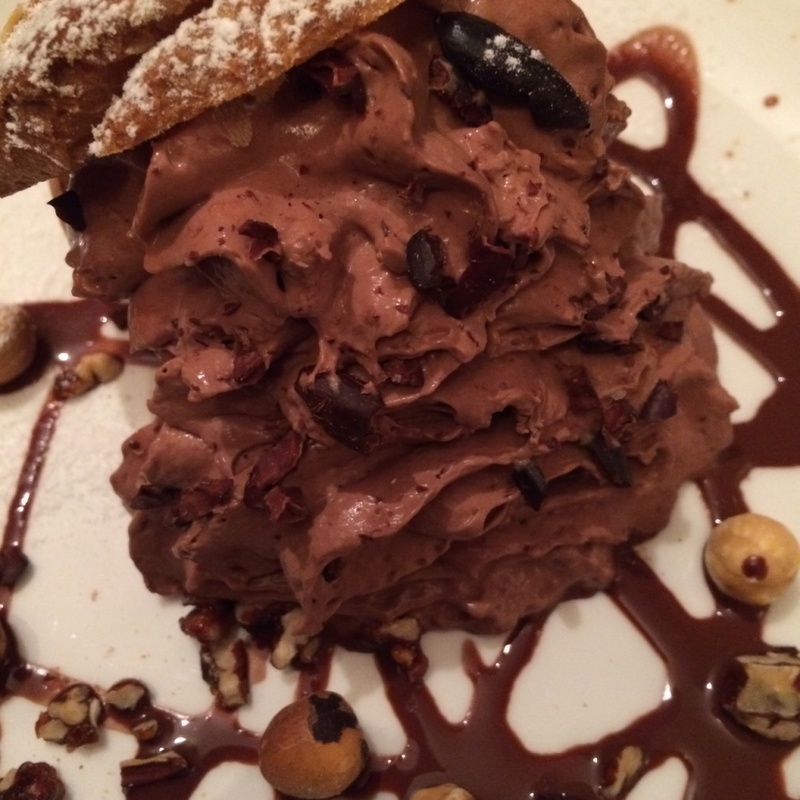 Courtny chose the chocolate mousse which was a chocolate fantasy fulfilled. 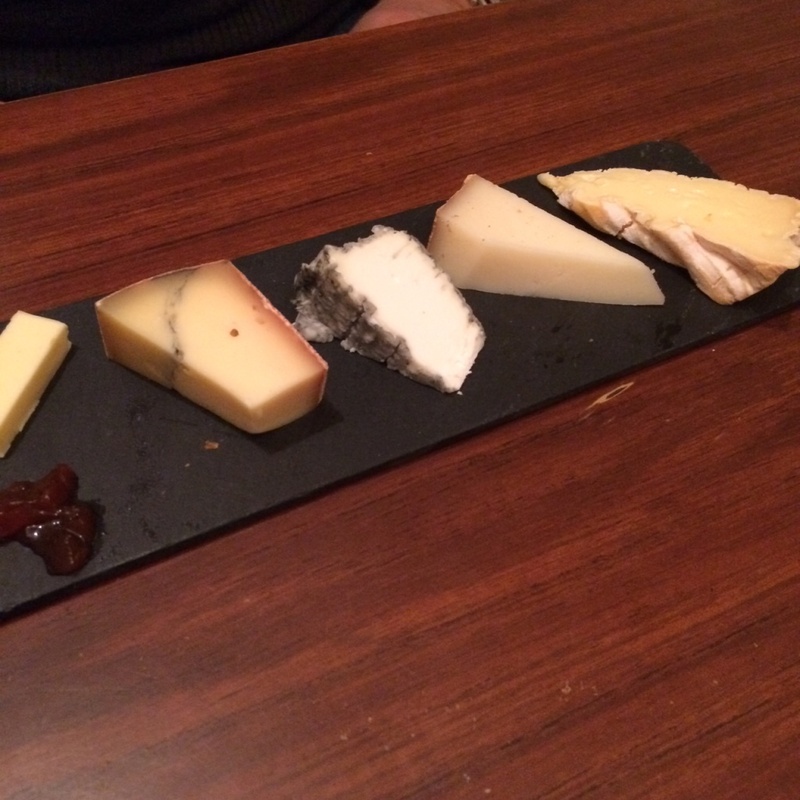 David selected the cheese board. We enthusiastically shared everything. Super model and actress, Amber Valletta, was seated next to us. I am delighted to report that she indulged in the absolutely delicious crusty dark bread, consumed the rich pumpkin soup and sampled the foie gras…I did not stare, just fleeting glances. Afterwards, Tomoko introduced us to her talented husband, Chef Shinozuka. 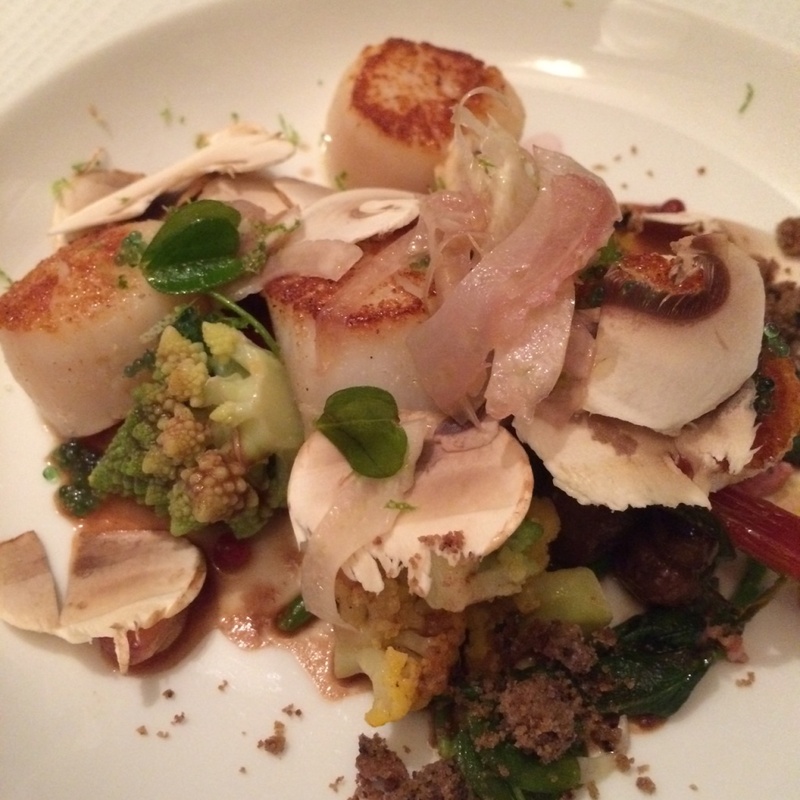 What a delicious and affable way to spend our last night in Paris…tres elegante et tres bien. We look forward to a return engagement. Les Enfants Rouges 9 Rue du Beauce, Paris. Open noon to 2pm and 7-10:00 except Tuesday.